Air France has just joined the unofficial “Creative Air Safety Video” movement by producing their very own, very French version of the short video that most of us have seen hundreds of times before. What I was surprised about is the sentence about “lost electronic devices”. I don’t think I have ever heard this instruction on any airplane from any airlines before – it sounds a bit surprising to me. Probably there is a reason for it, I’m wondering what it may be. If you have an idea, please share it in a comment below! With the bankruptcy of oneworld member Malév Hungarian Airlines on 03 February, 2012, Hungary was left without a national air carrier. About 18 months later, this (temporary) status seems to come to an end with the rise of a new Hungarian air carrier: SÓLYOM Hungarian Airways. In 2012, the market reacted quickly to fill the missing capacity left behind by the collapse of Malév, with Ryanair moving into the Hungarian market within days, Wizzair placing more aircraft to Budapest, and other carriers raising capacity and/or frequency soon after. The classical European airlines raised prices as they practically inherited a monopoly between their respective hubs and Budapest, especially among the business travelers. All long-haul operations from Budapest have also been suspended soon after Malév stopped flying. There were brave and not so brave initiatives among ex-Malév colleagues and outsiders to start a new airline in the last year or so, but they all proved to be a speculation or more of an “idea” by enthusiastic amateurs. Then in early July 2013, one of the Hungarian newspapers reported that a new Airline is being formed, under the name of Sólyom. Many Hungarians rushed to comment about the name being hard to pronounce for foreigners, the fleet plans being too optimistic over the coming years, the business model being outdated and such, but interest was definitely raised among aviation enthusiasts in the country. First routes from Budapest: Amsterdam, Brussels, Frankfurt, London, Milan, Paris and Stockholm. No airports were mentioned (yet). Plan is to have these operating by the end of September, but needs further confirmation. Long-haul to start in the summer schedule of 2014 – with “North-American” destinations. New York is likely, but nothing is confirmed yet. Booking any of the flights is not yet open at this stage. The parent company in the Sólyom Airways Holding is owned by three Hungarian citizens (fact). Multiple fully owned subsidiary companies have been founded to deal with different areas of the operations. Money is coming from Middle-East investors, from Oman and the Emirates (as confirmed by the owners). Lot of speculation is flying around about the (potential) identity of these secret investors, we would not like to comment on that as nothing has been confirmed. classical, full service airline – they claim they will have a higher on-board service standard than most of the European airlines. NOT low-cost. Point-to-point as well as transfer passengers. Revitalizing Budapest Liszt Ferenc Airport as a Hub. We are waiting for more details to be unveiled over the coming days/weeks/months, and are giving up our initial skepticism as well by writing this first post about Sólyom on this blog. We are wishing good luck and success for the new Hungarian Airways, and hope to have more and more international passengers learning how to pronounce “Sólyom” in the near future! After our first flight (hopefully sooner rather than later) we will make sure to post a Flight Review here! Air India took its first Boeing 787-800 Dreamliner earlier this year and joined the elite club of 787 operators as the fifth member back in early September. Air India’s turnaround plan is highly dependent on the efficient operation of the new type. Only the fifth airline to take delivery of a 787 (following launch customer All Nippon Airways, Japan Airlines, Ethiopian Airlines and LAN Airlines) Air India’s first delivery was delayed by over four months because of negotiations over the issue of program delay compensation. The Indian government is also arguing with Boeing about the weight guarantees promised by the aircraft manufacturer earlier – but those discussions are continuing separately. Air India has 27 Dreamliners on firm order, and one of the early deliveries has been assembled in Boeing’s new South Carolina plant – where the delivery ceremony took place as well. The airline took delivery of a second 787 just a week after the first one, also in South Carolina. They are taking deliveries of 4 more planes by the end of 2012 (have three in operation at the time of this article), seven in 2012, five in 2014, six in 2015 and three in 2016 to complete their planned fleet of the type. With 18 seats in Business (pictured above) and 238 in Economy class (pictured below) (256 in total), Air India is right in the middle of the other 787 operators in terms of seat density (JAL and LAN have less seats, while ANA and Ethiopian have more). After the first month or so when the type was only used domestically, the first international destination of the Air India Boeing 787 has been Frankfurt, Germany. Today’s free Metropol ‘newspaper’ – distributed in public areas across Hungary – features the last Ad by Malév Hungarian Airlines on its last page – featuring portraits of current and ex-employees. It was paid for by the employees, who chose this extraordinary way to say goodbye to the passengers. 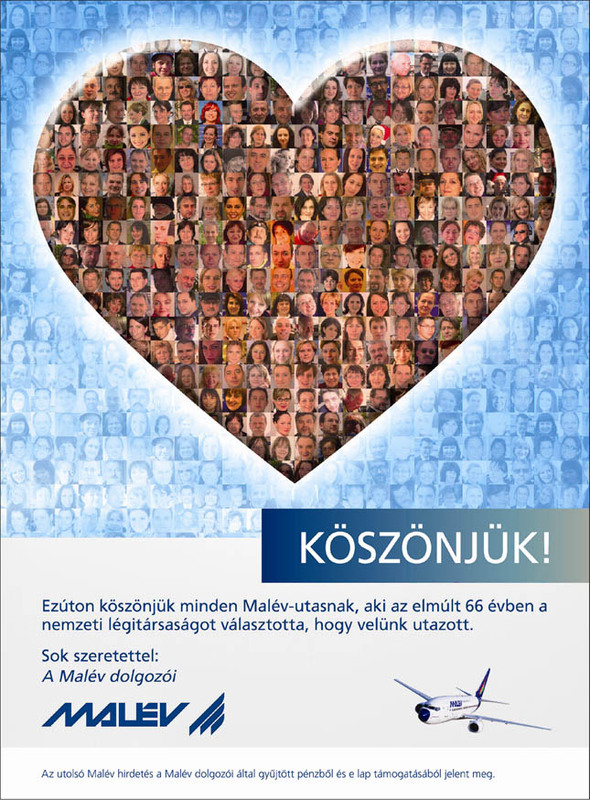 Márta Róna, communications director said: “The employees of Malév would like to thank the passengers with this symbolic last ad purchased by themselves. We keep all those lots of happy moments of 66 years spent together in hearts!” Malév ceased operations exactly one week ago, last Friday on February 3, 2012. We hereby thank all Malév passengers who chose to fly with the national airline in the last 66 years, for flying with us. 2012 is supposed to be the end of the world – according to the Mayas. I do not believe in that. But 2012 actually turns out to be the end, for at least a part of the world: for those of us who have ever worked at Malév Hungarian Airlines or somewhere in the Hungarian Aviation Industry. 3rd of February, 2012. The date when Malév – the 66 year old Hungarian Airlines – disappeared from the skies. At some point in its history it was part of the North-American skies, the Asian skies, the Middle-Eastern skies and the African skies. But most importantly, Malév was always part of the European skies. And it was proud of it. Malev was also proud to become a European Union flag carrier in 2004 – but ironically this status put the latest nail in its coffin. A coffin that was started to be built about 20 years ago, sometime in the early 1990’s, after the political change in this part of the world. Anyway, while growing up, I built about 70 plastic planes, and watched airliners at Budapest Ferihegy Airport Terminal 1 observation deck a few times. I was really jealous of my father visiting his best friend in Stockholm with an SAS DC-9. Then at the age of 8, my parents couldn’t take me away from the observation deck of the Frankfurt Airport for more than two hours… I was amazed by seeing so many planes and identifying each flag carrier by their tail design. Then at 11, I flew for the first time in my life – and like most of the Hungarians older than 15 – I had my first flying experience aboard Malév. It was a Tupolev Tu-154. I was so excited about this flight, that I threw up – funnily after we landed in Rome… I can still remember that the flight attendants on that flight were extremely nice and helpful. Really. Then I flew about 10 times with them before I joined Malév in 2003. On my first interview (with Szafi) I was told that we would try to save the airline with the new e-business solutions, but it may not be flying in one year. I convinced myself that it was a great opportunity to be a member of the team that may save the Hungarian National Flag Carrier – especially being fresh out of the university, without a family to support, just starting my carrier. And I’m glad I convinced myself of this risk, as I had enjoyed 3 great years there – plus I met so many wonderful people, including my wife! I really had the privilege of getting to know so many people across the whole company while working with the BPR part of the team who introduced online booking – and later e-ticketing. I became friends with colleagues at the Pricing Department, Scheduling, Domestic and International Sales, the Ticketing offices, the Call Center, Finance, Marketing, Legal, Communications, Airport Operations in Budapest and at a number of stations we flew to – just to mention a few. As an aviation enthusiast employee, I had of course met and talked to a number of Malév pilots and flight attendants as well. Some of these people have moved on over the years and are now working at other companies, but some of them just lost their jobs – yesterday. I truly share their feelings as much as possible and wish them strength and all the best in the coming days, weeks! On the other hand, we must also talk about realities. I hate to say this, but such an airline with so many CEO’s and ever changing strategy over decades, was destined to die. We all knew this. We just didn’t want to believe it. And we were all shocked when as an employee first heard the ‘rumours’ that we may not get our next salary. Then the ‘old folks’ told us ‘Don’t worry, this has been happening at least once a year for the last decade, there is always a solution!‘ And we tried to believe them, but then waited for the next salary with nervousness. And it was transferred. Then a few months later it happened again. It got transferred again. For the third time I already felt like the ‘old folks’ – no worries, this is just a small panic. And it would probably go on like this for the latest newcomers for years to come – only if the EU would not rule out financial help by the state. They say this is to protect competition. From the Budapest flight market one thing has disappeared yesterday: the main competitor. Meaning that there will be no real competition from now on, as the other flag carriers flying to Budapest will be the sole carriers on their respective routes. Who will stop Lufthansa to raise their fares to Hamburg or Frankfurt, or BA to London, or Air France to Paris – when there is no other airline flying there from Budapest? What will the EU say now? Also, if there is no state-aid for the Air Carriers, why can be state-aid for banks when they are in trouble? Or for car manufacturers when they are in trouble? Why not for Air Carriers when they are in trouble? Like Spanair a week ago and now Malév. Who will be next in a week’s time? CSA Czech Airlines? LOT? SAS? Is the EU protecting competition, or is it protecting the three large European Airline conglomerates (Lufthansa group, Air France-KLM group and BA-Iberia group) and low-cost carriers? Malev is now gone. From the skies. Physically it only remains in the Airplane Museum at the Budapest Liszt Ferenc Airport – unfortunately no Boeing 737 NG planes will ever be exhibited there, as they were all flown back to the lessor ILFC last night already. But it remains in the hearts of those who ever worked there. And for those who are just now joining the world outside of Malév, I can guarantee one thing: You will continue to talk about Malév as ‘us’ and ‘we’ for decades to come. Trust me, I know, because I do that all the time, too. Rest In Peace, Blue-Nosed, Malév Hungarian Airlines! Aeroflot, the first Russian operator of the latest Russian passenger jetliner, the Sukhoi Superjet is introducing the plane to international routes after the initial domestic routes. SkyTeam member Aeroflot has been using the Sukhoi Superjet (SSJ100) only on domestic routes so far, but launched it for international services on December 4, 2011 with the first SSJ flight between Moscow Sheremetyevo Airport and Oslo in Norway. They have also revealed that the aircraft is expected to fly from Moscow to Budapest in Hungary as well, raising the international routes flown by the SuperJet to two. “The fact that the SSJ100 started to serve international routes of Aeroflot reflects the confidence of the airline in the reliability of our aircraft. We believe that the SSJ100 aircraft will efficiently serve both international and domestic routes of Aeroflot and will do our best to make sure that the growing fleet of SSJ100 meets the expectations of the airline,” Sukhoi Civil Aircraft president Vladimir Prisyazhnyuk said. The largest Russian air company has 30 Superjets on order, and currently operates three SSJ100s, which serve routes to St. Petersburg, Nizhny Novgorod, Yekaterinburg, Ufa, Astrakhan, Chelyabinsk, Kazan, Anapa, Perm and Minsk. Aeroflot was the SSJ100’s first Russian customer and took first delivery in May, only one month after launch customer Armenian Armavia introduced the first ever SSJ100 in April. A Boeing 767 operated by LOT Polish Airlines made a successful emergency landing in Warsaw, Poland on Tuesday, 1 November, after a hydraulic failure led to the landing gears not opening before landing. Flight LO-16 was bound to Warszawa-Frédéric Chopin Airport from New York Newark airport with 220 passengers and 11 crew onboard. According to Aviation Safety Network, at about 13:16 local time, while on approach to Warsaw’s runway 33, the crew encountered problems lowering the undercarriage (gears). The airplane entered a holding pattern at 2750 feet but the gear could not be deployed. While on holding, they burnt off most of the remaining fuel onboard, and thenthe crew decided to carry out a gear-up landing on runway 33 at 14:35. Nobody was hurt in the “text-book” emergency landing.